THE CALIFORNIA LABOR FEDERATION is dedicated to building power for working people and their families. 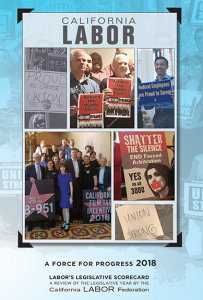 With more than 1,200 affiliated local unions representing 2.1 million union members, we are actively engaged in every aspect of California’s economy and government. Together, we fight for legislation that protects working families, and we hold our legislators accountable. Together, we are the California Labor Movement. About this scorecard: This legislative scorecard reviews California Labor’s legislative progress and rates the performance of California legislators. You will find a description of key bills the Federation and our affiliated unions lobbied for and against, and a scorecard for all Senate and Assembly members on each bill. Congratulations to the Legislators with 100% Voting Records in 2018! Older editions of our “Force for Progress” legislative voting records can be found in the online archives.